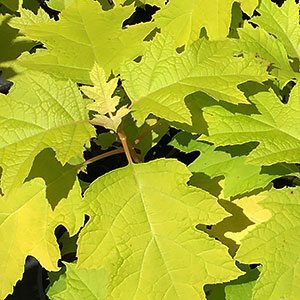 With attractive golden to lime green foliage Hydrangea quercifolia ‘Little Honey’ is an Oakleaf hydrangea with a difference. It is the new foliage that emerges a golden honey colour. Its does tend toward the lime green as it ages, and then we have the wonderful brilliants reds as we move into winter. The flowers form in white panicles and the foliage is typical of the Oakleaf types in shape. This is a slow growing form, it also loves light shade. So with its bright foliage it can be used to add a lift to any shaded area of the garden. Over time it will reach around 1 metre in height, sometimes a little taller. Hydrangea quercifolia ‘Little Honey’ – Landscaping Uses. If you an area in the garden that is naturally shaded, especially in the afternoon, the Hydrangea quercifolia ‘Little Honey’ is a great foliage plant to give it a lift. You can plant it infant of taller growing darker foliaged plants to add contrast. Although the foliage if a golden yellow, it is soft in colour, so not at all annoying to the eye. In deep shade, the foliage will tend to more on the lime green side, so consider this when planting. Hydrangea ‘Little Honey’ is at its best in a humus rich moist, yet well drained soil. It is suited to light shade, in hot sun or very dry conditions the foliage can tend to burn. The best planting position is in morning sun with afternoon shade. This allows the foliage colour to reach its potential. Sometimes sold a dwarf form, ’Little Honey’ can reach over 1m metre. It is however easily pruned to a smaller size.